In early December 2018, Fonterra announced the new Advance Rate Schedule that saw the December '18 base Advance Rate set at $4.00, down from the previous rate of $4.15. Simply put, this means that farmers will be paid $4.00 for all milk solids supplied in the month of December 2018, less a deduction of 15 cents on all of their milk solids supplied between June-November inclusive that have been paid at the $4.15 level. Using the extended code Last Season's (LS) open a worksheet with a payment date of January 2019 in your working or draft plan. Once January has finished, remove the amount you calculated for January from your plan. 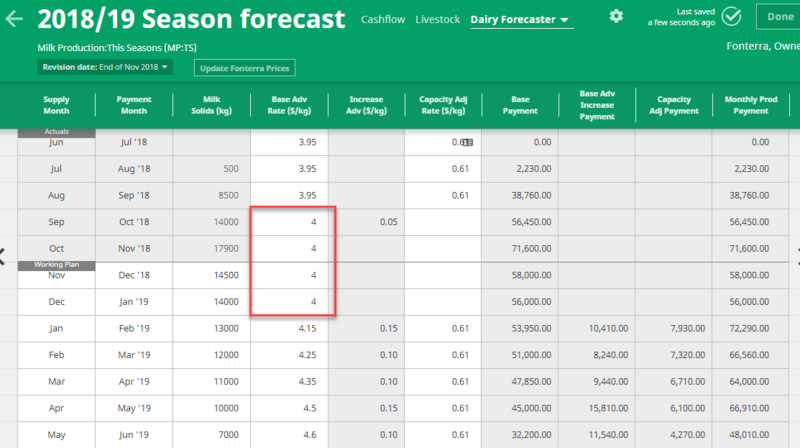 In the Dairy Forecaster, change the Base Adv Rate for supply months September - November from $4.15 to $4.00. Everything will come out in the wash when the milk solids provided for the season to date are retrospectively paid in February. Create a new extended code under Milk Production for the Balancing Retro. Make sure you set the code type to Expense. 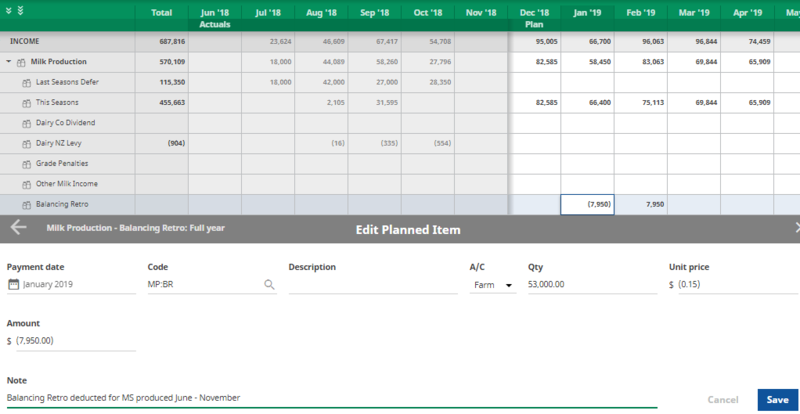 Using the new extended code, open a worksheet with a payment date of January 2019 in your working or draft plan. Finally, using the same extended code, enter the same amount as a credit in February.